VietNamNet Bridge – Coastal forest in the Mekong Delta is being narrowed while the sea is infiltrating deeply into the mainland. The so-called "protective forest" outside a concrete dike in Nha Mat ward, Bac Lieu city. In mid-May, 2012, correspondents followed a group of experts of the Center for Preservation and Development of Water Resources to make a survey of mangrove forest and sea dikes in the Mekong Delta. They visited Cu Lao Dung district, in Soc Trang province. This is the largest and the last islet of the Hau River. The islet fronts the East Sea in one side. Mr. Tran Kim Chuong, head of the Natural Resources and Environment Department of Cu Lao Dung, said that the district’s An Thanh Nam commune is expanded by 50 hectares yearly towards the sea while An Thanh 1 commune loses 1,000 to 2,000sq.m of land per year because the sea encroachment. An Thanh Nam is expanded to the sea because it has maintained 1,200 hectares of coastal preventive forest. Local people said that thousands of bats have appeared in the local forest. This is a good sign, showing environmental improvement. Meanwhile, in Bac Lieu province, the preventive forest has narrowed by nearly 10 percent in the last three years, to 4,600 hectares. With 56km of coast, this area of protective forest is not enough to prevent the sea from encroaching into the mainland. Nha Mat ward in Bac Lieu province was a preventive forest in the past. Today, this area has become a crowded residential area. 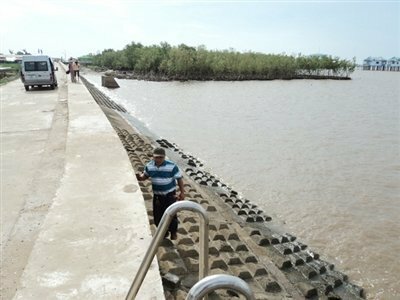 Mr. Nguyen Kim Huynh, 49, in Nha Mat ward, pointed to a concrete dike and said that this sea die was broken several times by powerful waves. Huynh said that in the season of northeast wind, sea waves are several meters high and the dike could not stand these waves. Since the coastal forest was destroyed, the sea has had less fish, the man said, adding that he could earn several USD a day from catching fish. Dr. Duong Van Ni, lecturer of the Environment and Natural Resources of the Can Tho University, said that in this situation, preventive forest outside sea dikes will gradually disappear. Ni explained that coastal forest is a closed ecological system, which can move forward and backward. The construction of concrete dikes has broken the living vessel and the way to move backward of forest. The Ganh Hao River, which separates Bac Lieu and Ca Mau provinces in southern Vietnam, is around 50km long. The river runs to the sea, making it become a busy fishing port. Several decades ago, Ganh Hao was a wild area, covered by jungle. Nowadays, the forest has nearly disappeared. After a fierce landslide, a concrete dike was built along the Ganh Hao River, which is called the shield to protect the town. Mr. Be said at present, the dike can defend his house but he was not sure about the future. Be’s house is near the dike and he said that during the northeast wind season, waves were 1-2m higher than the dike. 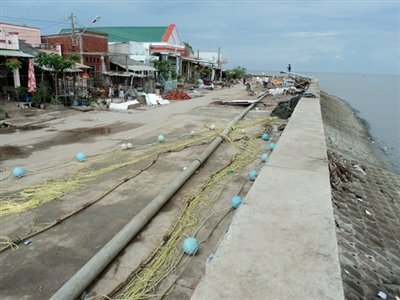 In late 2011, the sea water rose high in Bac Lieu, which was said to be an abnormal phenomenon, and flooded the Ganh Hao fishing port, isolating hundreds of families. Perhaps the time that people encroaching into the sea has ended. Dr. Le Anh Tuan from the Institute for Climate Change Research of the Can Tho University said that research works showed that the sea will continue rising in the future. Impacts from climate change on the Mekong Delta are anticipated to be huge and they will be fiercer if hydro-power plants are built on the main stream of the Mekong River. Upgrading sea dikes is considered an urgent task in the Mekong Delta to confront the rise of sea levels. In addition, planting preventive forest along the coast is very important, experts said.